Original plan called for staying at Oshkosh until Thursday morning. Weather is known to throw monkey wrenches into even the most carefully crafted plans. Come Wednesday morning, a weather system was moving in, that was supposed to bring in heavy precipitation and low ceilings. The low ceilings were slated to persist at Oshkosh until Thursday afternoon. And Oshkosh has airshows during the afternoons, so that the airport is closed for departures and arrivals during the airshow. The airshow ends around 6 PM which leaves a window of only about 2 hours until the airport closes for the night. Another factor in the decision to depart early was my 30+ year old tent. Ada has warned me it leaks from the floor up and I did not have high levels of confidence about protection from the top either. The system was supposed to arrive around 2 PM so by 10 AM I decided to cut short my Oshkosh time and depart. I packed the tent (a mistake), said good bye to Lisa who was going to return back to California with another co-worker of ours and started a pre-flight inspection. During the pre-flight a couple of volunteers showed up and asked me if I am departing and if I needed help. I sure needed help to get the airplane out of its place on the grass so I gladly accepted their help. The NOTAM said I need to pull the airplane out to the row and only start the engine with a permission. Got the permission from the volunteers and taxied to taxiway P1. Followed the taxiway down and got directed to runway 36L for departure. Since nobody was following me I did the runup sequence while taxiing, and after a short wait I was off the ground, with my transponder off until clear of Oshkosh class D and going south. Original plan called for going direct to Atlanta. Since I now had one more day that I could use to fly, I decided to try to reach the Atlantic Ocean in a bid to make this trip a true cross country flight – from Pacific to Atlantic and back. Yes, we took off from San Jose over San Francisco Bay so the airplane definitely flew over Pacific. Now it just needs to fly over Atlantic to complete the feat. I decided to go around Chicago class B airspace to the west. Initially I thought to stop at Rockford, Illinois to get fuel but decided against it due to incoming weather from the west. I wasn’t yet clear of it and a delay of an hour could get me trapped on the ground and behind the fast moving front. 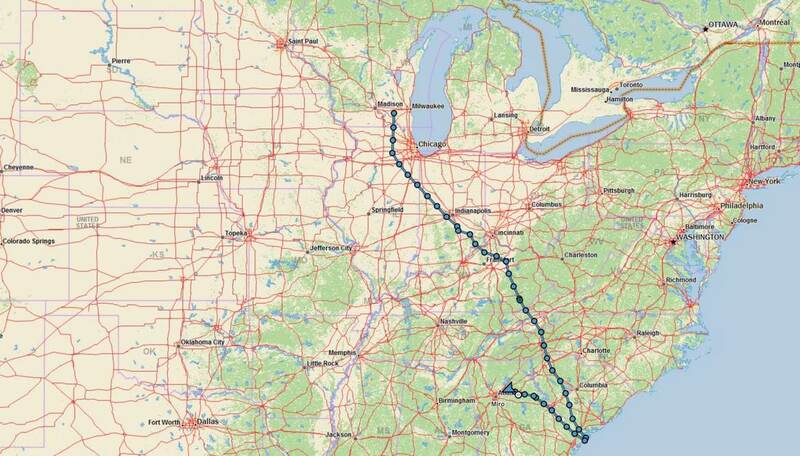 I had plenty of fuel so continued down to the south east through Illinois. 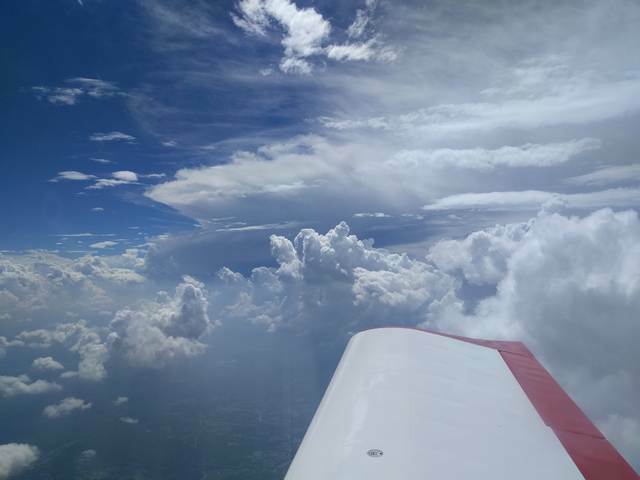 Cumulus clouds started popping up but the ADS-B weather reported clear down in Indiana. Decided to land to stretch the legs and refuel in Columbus, Ohio. Yes, I saw “Columbus” and immediately thought, “oh, Columbus, Ohio, sweet”. It wasn’t until I landed, got fuel (34.0 gallons), used a restroom and sat down to plan the following route, that I realized I was actually in Columbus, Indiana. Columbus, Ohio wasn’t that far away but I was in Indiana, not Ohio. 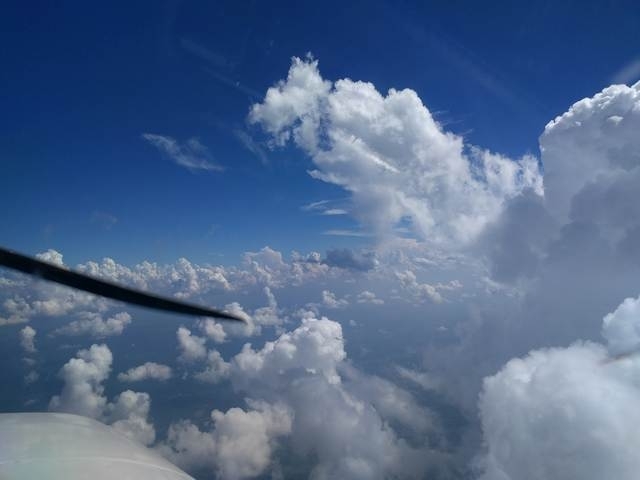 Departure from Columbus, Indiana and climb to 6,500 feet was uneventful but soon I would need to deal with a low pressure system that was triggering some precipitation over Kentucky and Tennessee. 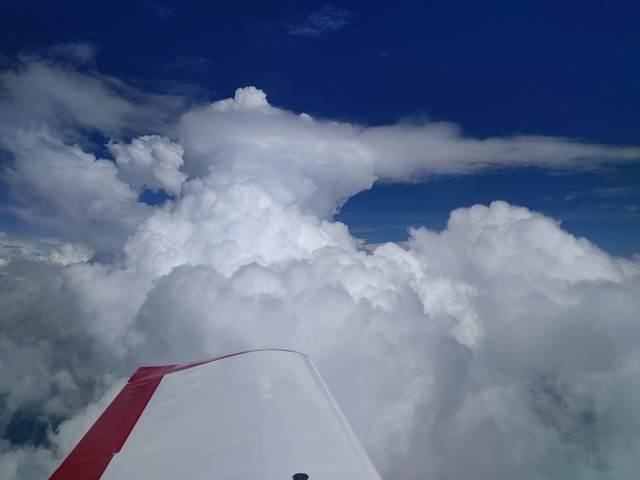 Indeed, the clouds became a bit more developed and thunderstorms and other areas of intense precipitation started appearing on the weather radar. ADS-B is a blessing when going on long cross country flights. See for yourself, how angry some of those clouds looked. Kentucky greeted me with the clouds you can see above. I climbed to 8,500 feet then to 10,500 feet. Indy Center stopped me from climbing and kept me at 10,000 feet for about 10 minutes, not allowing further climb so I had to scramble to stay clear of clouds. Finally, I was allowed to climb higher and go over some smaller buildups. While some of the tall clouds looked nice, I was sure I wouldn’t want to be near them. The ride was surprisingly smooth at 10,500, no turbulence at all, even with all those buildups around me. That probably meant I kept healthy distance from the bigger ones. 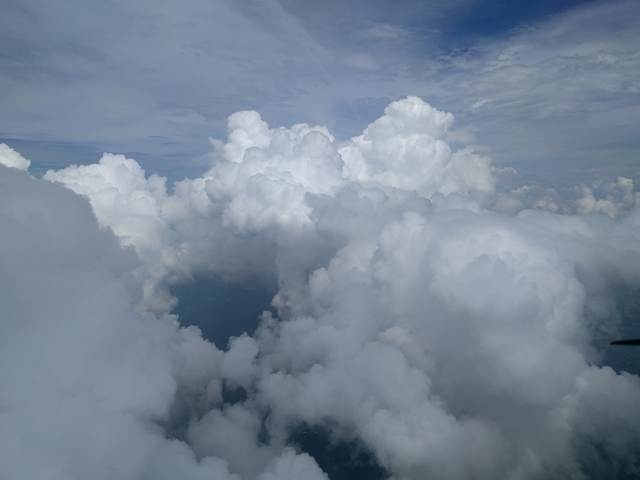 I initially asked for flight following to Greenville, North Carolina, as I wasn’t sure I would be able to go through the front with all the activity popping up around me. Near Greenville it became clear that I will be able to reach Hilton Head without any issues (neither fuel nor weather) so I asked to change flight following to Hilton Head. 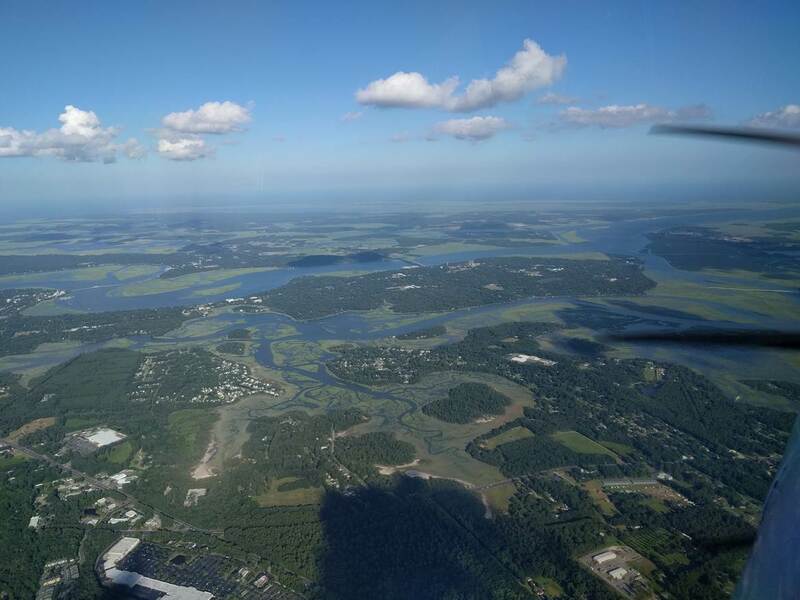 Arrived at Hilton Head late in the afternoon (around 6 PM) and flew my airplane over Atlantic Ocean to get there (Hilton Head is an island). The views were great, see for yourself below. The FBO arranged a hotel for me and dropped me off there. When I asked about southern eatery, the FBO line attendant recommended “Street Meet” cafe in a nearby shopping center. It was great, I had a barbecue wrap, sweet tea and some local beer. Good stuff, although don’t tell that to my dietitian! The previous day was quite tiring, I went to sleep around 9 PM and woke up 6 AM. I was not in a great hurry to depart but since I woke up at 6, I packed up and walked to the airport (about 2 kilometers from the hotel). The temperature was still manageable at that hour at 27 degrees C. The FBO at Hilton Head filled up the airplane (took 34.6 gallons) and I was ready to go. This flight was supposed to be a homecoming for me. I planned to go and land at Washington, Wilkes County, Georgia and Winder, Barrow County, Georgia before I arrived at Lawrenceville, Gwinnett County, Georgia. Why? Oh, Washington was my first solo cross country destination when I was doing my private pilot license. Winder was the airport my instructor and I (ab)used for landing practice. And, of course, Lawrenceville was the closest airport to home so that’s where the flight school was. Navigation nowadays, with GPS is so easy. 16 years ago, when I was completing my first solo cross country, I completely missed the Washington airport. From dead reckoning I was able to tell I overshot it so came back using pilotage and found it. Paper charts, no GPS and being unfamiliar with VOR navigation made it so much harder. Kids these days have it easy. Landed at each airport uneventfully, Winder had a good deal of training traffic already (someone shooting an approach to 31, someone practicing landings on 23). I landed, taxied back and waited for a 172 to complete a touch and go. He seemed so slow compared to my RV-10! Finally, arrived at Lawrenceville, landed and parked for the night at Gwinnett Aero. They filled my fuel tanks (took 25.8 gallons) and my oxygen tank since we planned to go through Colorado, Utah and Nevada on our way back. Of course, weather would change our plans, but for the better!